If you’ve seen the announcement for the iPhone 7, one of the key points Apple focused on was the fact that the iPhone was “water-resistant”. If you look at one of the latest commercials from Apple, it again emphasizes the fact that the iPhone is Water Resistant. However….don’t let that fool you. One of the big keys of the iPhone (and iPods) is that “Liquid damage to iPhone or iPod isn’t covered by warranty”. If liquid damages an iPhone or iPod (for example, coffee or a soft drink), the service for the liquid damage isn’t covered by the Apple one-year limited warranty or an AppleCare Protection Plan (APP). 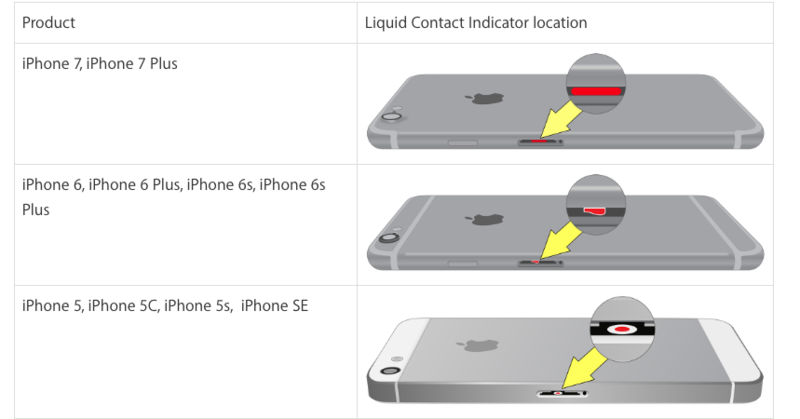 iPhone and most iPod devices that were built after 2006 have built-in Liquid Contact Indicators that will show whether the device has been in contact with water or a liquid containing water. An LCI will activate when it contacts water or a liquid containing water. The indicator’s color is normally white or silver, but when it contacts water or a liquid containing water, it will turn fully red. An LCI won’t activate because of humidity and temperature changes that are within the product’s environmental requirements. So even though Apple keeps advertising the water-resistant features of the iPhone, it’s a good idea to try to avoid finding out for yourself. As noted in the pictures above, if the LCI on your device (any device made after 2006) activates, then you will lose your warranty.